Since the brand’s inception 25 years ago, Rationale has provided Australia’s leading skin doctors with long-term, scientific skincare solutions that deliver on their promises. Rationale products actualise the natural and genetic potential of skin, employing skin-identical ingredients and Isotropic technology to deliver our trademark luminosity. Good reasons why Rationale has become, and remains, the preferred cosmeceutical brand of Australian Dermatologists, Plastic Surgeons and Cosmetic Doctors. The culmination of 25 years of Rationale R+D are their groundbreaking Isotropic Formulations. Formulations that are Skin Identical, delivering perfect synchronicity with the skin. Call, email or pop by the Skin Revival clinic to order your Rationale. 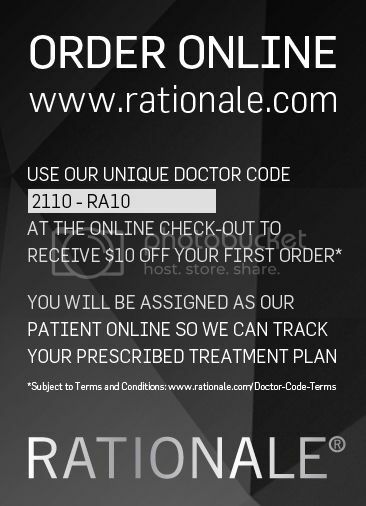 Alternatively order via the Rationale webstore and use our unique doctor code: 2110-RA10 to let them know you are a Skin Revival customer and recieve $10 off your first purchase.